Day to day maintenance is checking things like content which needs validating and checking for spam posts. Other tasks include monitoring the security and error logs. There are a number of tasks which are more or less daily tasks if you have a highly-active site. Some of these tasks may not need to be done every day, but can build up if left unchecked. The larger your site community grows the more tasks will need looking after, and you will have to judge when the time is right to expand your website's staff. By adding more staff it frees you up as your new staff members can look after some tasks. If you add new staff you need to be clear what tasks they are required to undertake. 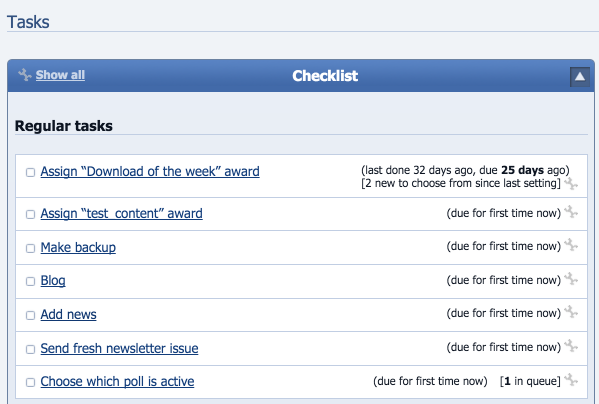 The dashboard screen in Composr lists a number of tasks which need to be completed such as adding new content and setting the poll as reminders. Keeping track of forum posts will be a large part of any community site and Composr offers a 'Topics with unread posts' screen which can be found at http://yourwebsite/forum/pg/vforums/unread (assuming short URLs are configured). For sites with galleries (for example – but any content really) you will also need to keep track of uploads there. If your site limits the ability to post for newer members, you will have to keep track of non-validated entries which will be linked from your dashboard screen. By leaving entries non-validated for a long time it is likely the users will leave the site so you need to keep track of this at least once a day. Fortunately you can set e-mail notifications in your account so that you don't actually need to keep regularly checking manually. In the Audit section of the Composr Admin Zone you can find a number of really useful tools to keep your site running smoothly. 3 areas you will need from time to time are the, Action, Security and Error logs. The Action log is a log of all the actions of your site members so you can see exactly what each user has been up to on your site. I'm sure you can imagine why this would be extremely useful especially on larger sites and if you have a potential problem member. The Security log gives you a list of failed logins and anywhere a CAPTCHA form has been failed to be complete. The latter might indicate a spammer is attempting to post on your site. The error log is as it sounds and it displays errors which Composr has reported. You can keep an eye on this log to make sure nothing is being reported which will seriously hinder your website performance. Also in this section is the contact us messaging log where you can keep track of all the messages sent through the contact us system (if you're using that). It is important you keep on top of your site to avoid any issues building up and by utilising the tools above Composr will allow you to do this quickly and easily.